For those of you who don’t know, Mae Whitman is the voice of Tinkerbell in the Pixie Hollow universe, as well as the voice of many other characters on TV and in video games, including DC stuff and TMNT. Incidentally, she was also the President’s daughter in Independence Day, so she’s been around for years, has a ton of work under her belt, and has built a career out of being a voice-over star. But that’s about where her fame ends. She’d like to be a serious actress, has tried to branch out into films, but hasn’t quite stuck as a leading lady quite yet. She doesn’t look like a star, if we’re being honest, and may not have the exact talent level we’re looking for either, which becomes disappointing apparent in Operator, a film I had high hopes for but one that didn’t live up to them. Joe Larsen is the creator of an interactive help line for a healthcare company, a voice that can walk you through the prompts and get you the help you need. But the computer program doesn’t come across to the customers exactly as was intended, sounding high-handed and callow, setting executives on edge. So Joe redesigns the interface, this time using his wife Emily’s voice and personality as the makeup for the character. Emily is a concierge with big dreams, a women who hates her job but is excellent at it. Her voice and manner sooth upset patrons, a perfect vehicle for Joe’s company. But when Joe begins to become obsessed with the fake Emily, preferring her to his real partner, the flaws of humanity step right into the spotlight. 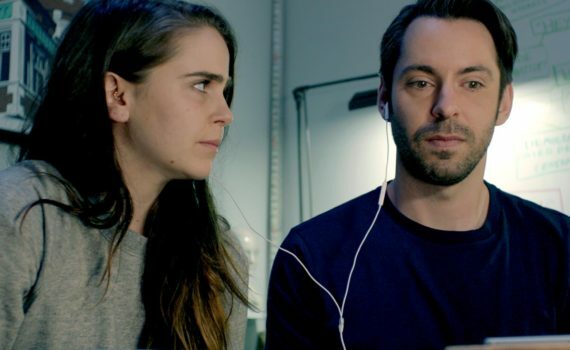 It’s good to see Martin Starr in a lead role, he’s got a cool quirkiness that I dig. And it’s great to see Mae Whitman in front of the camera, taking a break from the voice-over stuff but in a film that uses her talents in a very clever way. Unfortunately, that’s about where the positives end. The movie is clever, there’s a message here, and they were very smart to use Mae’s voice as a driving force behind the plot. But no one involved had the talent to take Operator to the next level, to make it anything more than a cheap, indie copy of Her and a bit of a dud overall. Nat Faxon steps in as comic relief, but the guy’s not a solid actor, and the writing handed to these characters wasn’t strong enough to give them a leg up. The film is quick and simple, but not excellent, instead settling into an undesirable state of “OK” that can’t be what anyone was shooting for.